Police have been on patrol in an anti-drugs and drink operation. Police are warning again of the dangers of drugs, after finding a teenager last night (Friday) miles from home and apparently under the influence of drugs. Writing on their Craigavon, Armagh and Banbridge Facebook pages they said they helped the girl to get home safely “but her night could have ended up so much worse”. “Every time you take drugs you are dicing with death,” they said. They also warned about the rise in prescription drug use. “If you think something is ‘safe’ because it can be prescribed, that’s a potentially fatal mistake. Every tablet has a series of side effects and, if taken outside of medical advice, these can be fatal,” they said. And they posted a picture of the room where doctors have “suctioned vomit out of kids’ mouths, cracked ribs whilst trying to restart hearts, and on occasion not been able to. Sometimes, they don’t even make it to resus”. “We need teenagers to take note of this warning. That resus room is horrendous. The family room, where your parents could be told that you’re in a coma, or have died, is even worse. That’s if you make it as far as hospital. “Parents, we need you to step up. Make it your business to know where your children are, who they are with, and what they have access to. It will involve tricky conversations but trust me, as someone who has given THAT news- it’s nowhere near as tricky as hearing that your child is dead,” they said. 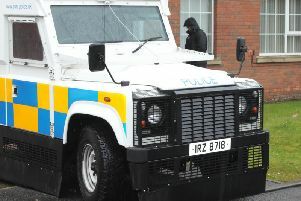 For the last few days, crews across Armagh, Banbridge and Craigavon have been taking part in Op Snapper patrols. They have been on patrol in the antisocial behaviour hotspots carrying out drugs searches, seizing alcohol and taking children home where needed. They have also been reminding parents and teenagers of the danger of abuse of drink and drugs. Anyone with information on drug dealers is asked to phone 101, or talk to Crimestoppers anonymously on 0800 555 111.